I have been eagerly anticipating Chelsea Fine’s next contemporary since finishing Sophie & Carter, and I’m glad to report that Best Kind of Broken was so very worth the wait. I know. I read a new adult novel and actually liked it. 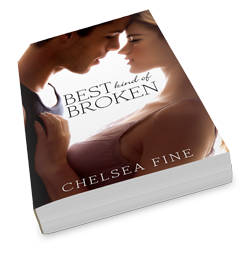 Where Best Kind of Broken excels for me is Chelsea’s strong characters who develop independently, as well as together, and her primary relationship focus being on the emotional. Sure there’s crackling romantic tension, but primarily this story is about two friends (who might’ve been more) estranged after a tragedy who are now forced to deal and duke it out with each other and all their unresolved, unaired issues. And Chelsea does this in a way that is beautifully funny, poignant, messy, sweet, spicy, tear-worthy, and yes, a bit smolderific as Pixie & Levi try to figure out how they’re supposed to live in the wake of their crippling loss. And this strong — and well done — emphasis on the individual healing of Pixie & Levi and the emotional relationship between the two of them made this book a winner for me. Told from both Pixie and Levi’s perspective, these are two characters (who feel like real people, instead of BTDT, cardboard stereotypes), with wonderfully unique voices that I connected with right off the bat. Both a bit broken, both of them stuck, both of them grieving, both of them stubborn and not exactly thrilled at being maneuvered into working with each other for the summer. And so, they try to avoid each other. At least, as much as that is possible when you share a bathroom. And when avoidance doesn’t work, annoyance. <insert much hilarity here> From their “hot water wars,” to learning to throw the perfect spiral, to “scruffy cheese,” to reappropriated Transformers and more, Chelsea also does a fantastic job of establishing their past history together — Levi’s family being a stand-in for Pixie’s own, then later as best friends, to “Status: Indefinable” — and as a result, their chemistry and interactions feel layered and organic. And the banter! Oh, the banter. There really is nothing like well-written, clever banter. Ermiright? Overall, if you’re looking for a new adult novel that deviates from the norm, with depth and fantastic characters (not to mention, great dialogue), I’d definitely recommend Best Kind of Broken.